Wildlife Management Services cater our services to suit the intricacies of many different industries. Landfills in particular are required by EPA guidelines to have a programme in place for bird management; this is an area which we specialise in. 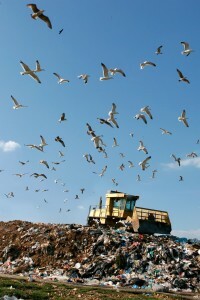 Scavenger birds such as starlings, crows, and seagulls are most commonly associated with active landfills. They can be a nuisance, transfer pathogens, litter and scrap to neighbouring areas, and also be a hazard to aircraft. Whilst there are many methods of control that can be employed at a landfill, many are only short term as the birds will adapt to the environment in order to find food. The main problem at landfills is the readily available food which is sometimes hard to control. Therefore it is recommended that a programme is put in place to include a mixture of the solutions that we would recommend below.